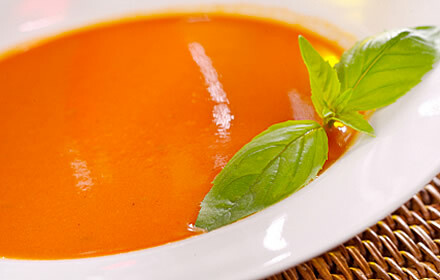 Passata is made from ripe tomatoes that have been puréed and sieved to remove the skin and seeds. It is sold in jars and can be smooth or chunky depending on the sieving. You can buy or make your own. Heat the olive oil in a pan and fry the onion and garlic together gently for two or three minutes until it has softened. Add the chilli powder and passata and bring to a simmer. Season with salt and freshly ground black pepper. Add the stock and cook for a further four or five minutes. Using a stick blender, process the soup until smooth. To serve, spoon the soup into a bowl and garnish with the parsley or bay. Drizzle over the olive oil.